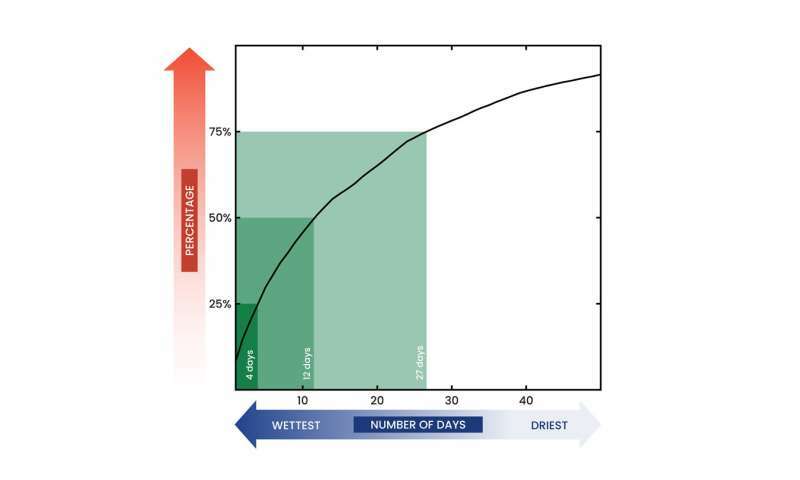 An analysis of rainfall measured at weather stations across the globe between 1999 and 2014 found that the median time it took for half of a year's precipitation to fall was just 12 days. A quarter of annual precipitation fell in just six days, and three-quarters fell in 27 days. Credit: ©UCAR. Simmi Sinha. Currently, half of the world's measured precipitation that falls in a year falls in just 12 days, according to a new analysis of data collected at weather stations across the globe. By century's end, climate models project that this lopsided distribution of rain and snow is likely to become even more skewed, with half of annual precipitation falling in 11 days. These results are published in Geophysical Research Letters, a journal of the American Geophysical Union. Previous studies have shown that we can expect both an increase in extreme weather events and a smaller increase in average annual precipitation in the future as the climate warms, but researchers are still exploring the relationship between those two trends. "This study shows how those two pieces fit together," said Angeline Pendergrass, a scientist at the National Center for Atmospheric Research (NCAR) and the lead author of the new study. "What we found is that the expected increases happen when it's already the wettest—the rainiest days get rainier." The findings, which suggest that flooding and the damage associated with it could also increase, have implications for water managers, urban planners, and emergency responders. The research results are also a concern for agriculture, which is more productive when rainfall is spread more evenly over the growing season. The research was supported by the U.S. Department of Energy and the National Science Foundation, which is NCAR's sponsor. Scientists who study extreme precipitation—and how such events may change in the future—have used a variety of metrics to define what qualifies as "extreme." Pendergrass noticed that in some cases the definitions were so broad that extreme precipitation events actually included the bulk of all precipitation. In those instances, "extreme precipitation" and "average precipitation" became essentially the same thing, making it difficult for scientists to understand from existing studies how the two would change independently as the climate warms. Other research teams have also been grappling with this problem. For example, a recent paper tried to quantify the unevenness of precipitation by adapting the Gini coefficient, a statistical tool often used to quantify income inequality, to instead look at the distribution of rainfall. Pendergrass wanted to find something even simpler and more intuitive that could be easily understood by both the public and other scientists. In the end, she chose to quantify the number of days it would take for half of a year's precipitation to fall. The results surprised her. "I would have guessed the number would be larger—perhaps a month," she said. "But when we looked at the median, or midpoint, from all the available observation stations, the number was just 12 days." For the analysis, Pendergrass worked with Reto Knutti, of the Institute for Atmospheric and Climate Science in Zurich, Switzerland. They used data from 185 ground stations for the 16 years from 1999 through 2014, a period when measurements could be validated against data from the Tropical Rainfall Measuring Mission (TRMM) satellite. While the stations were dispersed globally, the majority were in North America, Eurasia, and Australia. To look forward, the scientists used simulations from 36 of the world's leading climate models that had data for daily precipitation. Then they pinpointed what the climate model projections for the last 16 years of this century would translate to for the individual observation stations. They found that total annual precipitation at the observation stations increased slightly in the model runs, but the additional precipitation did not fall evenly. Instead, half of the extra rain and snow fell over just six days. This contributed to total precipitation also falling more unevenly than it does today, with half of a year's total precipitation falling in just 11 days by 2100, compared to 12 in the current climate. "While climate models generally project just a small increase in rain in general, we find this increase comes as a handful of events with much more rain and, therefore, could result in more negative impacts, including flooding," Pendergrass said. "We need to take this into account when we think about how to prepare for the future." The University Corporation for Atmospheric Research manages the National Center for Atmospheric Research under sponsorship by the National Science Foundation. Any opinions, findings and conclusions or recommendations expressed in this material do not necessarily reflect the views of the National Science Foundation. Why is this news? Kind of just stating the obvious? Rainfall amounts are kind of like a Gaussian distribution. When a hurricane or other large storm comes in, yes, there are going to be a few days when rainfall is very heavy, and it will make up a large proportion of the yearly rainfall. This has been happening for thousands of years. Are the authors trying to make some kind of political statement? "This has been happening for thousands of years. Are the authors trying to make some kind of political statement?" No, that would seem to be you getting political. From the TV show Rowan & Martin's Laugh-In, " very very interesting". It incredibly interesting article that describes the observations that we are seeing globally. Excellent article.